The movie comes out August 5th. I want to watch it. But i must see cowboys versus aliens first. Monkeys shooting at other monkeys can wait. Harrison ford as a cowboy fighting aliens cannot. lol@ monkeys shooting other monkeys…. exactly what I was thinking. You have to wait until the ape has to change magazines. Then rush them. Cornelius taught me that. Usually they show something exciting and cool to attract attention to a movie. That was boring as hell and the acting was terrible. That’s another $10 Hollywood won’t be getting from me. 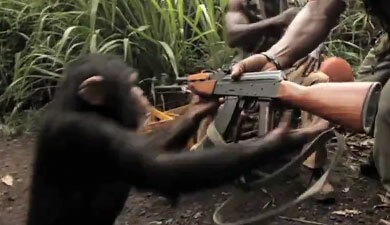 NEVER give a monkey a gun!!!!!! I thought Ceaser’s parents came from the future. Is this another retelling/rewriting of “The Planet of the Apes”? The previews I saw in the theator made it look like some type of DNA experiments.